Bermuda Royale World Tennis Center Condos: Most desirable subdivision in World Tennis Club! This 2 bedroom/2 bath, first floor unit has been meticulously maintained by the original owners. Very spacious, with 1598 Sq. Ft., large master suite and a one-car garage just steps from your front door. Enjoy a lush garden view from your screened lanai before or after your daily tennis. The best tennis value in Naples is included in the affordable maintenance fees. World Tennis Club features a fully staffed tennis pro shop, 16 tennis courts, 2 community pools, poolside cafe' and bocce. If you love tennis, you'll love WTC! World Tennis Center Condos: The comps are in. Designer remodeled 2 bedroom 2 bath condo in World Tennis Club. Extremely coveted 1st floor apartment with no stairs. Pet Friendly. Beautiful stainless steel appliances, sink and faucet, modern porcelain floor, beautiful lighting fixtures and fans, modern vanities with waterfall faucets, two outdoor patios in the front and rear, nice window treatments and so much more. The building is currently receiving brand a new roof. This centrally located and gated tennis community boasts 82 acres of tropical landscaping with 12 Har-Tru clay courts illuminated for night play and 4 hard courts, a full service pro shop with pro on duty, delicious restaurant and fun social events. A+ school district, extremely close to most shopping and a 10-15 minute drive to Downtown, Mercato and the Beach. Perfect for a second home. Flexible rental policy makes this an outstanding choice for an investor. Price is firm. World Tennis Center Condos: Exquisite 2 BR/2 BA first floor, lakefront condo. Upgrades galore! Enlarged, open kitchen, completely rebuilt, boasts of custom cabinetry, quartz countertops, tile backsplash, recessed can lighting, built-in wine rack and Whynter wine cooler. No detail overlooked. 24-inch porcelain tile laid on the diagonal throughout, new and updated baseboards, trim and crown molding throughout. Completely remodeled bathrooms with high custom-built vanities, a frameless glass shower enclosure in the master and attractive European-style shower fixtures in both bathrooms. Built-in workspace with custom granite desktop and bookshelves in guest bedroom. Outdoor closet in front screened entry provides loads of extra storage with floor-to-ceiling shelving and pegboard, and washer/dryer closet enlarged to accommodate standard size stackable. Attractive, small brick patio and garden just outside lanai give it an added touch. Offered turnkey furnished with just a few exclusions. Marbella World Tennis Center Condos: Very nice and very well maintained second floor condo located at desirable World Tennis Club. Tennis Players Paradise!! 16 tennis courts, pro shop, pool restaurants with lots of activities. Close to shopping, dining and the beautiful Naples beaches. This two bedroom, two bath room condo is in move in condition. Tiled floor through- out the whole condo and lanai. Nicely remodeled master bath room. Updated kitchen cabinets and newer appliances. Newer AC and water heather. A must see!!! World Tennis Center Iii World Tennis Center Condos: Great Location! Nicely furnished 2-bedroom 2-bathroom ground floor condo unit with tile throughout. Move-in or rental ready. The flexible rental policy makes this a great investment property or home to keep for yourself. Parking is located directly in front of the building. World Tennis Center is situated within an 82.5-acre community in Naples, Florida. The community has a dramatic Mediterranean-style architecture with cream stucco exteriors, graceful tropical landscaping, dotted by seven acres of lakes. Amenities include a Clubhouse and a community pool, a Cafe serving light refreshments, 16 tennis courts, a play area for kids and a basketball court. A desirable community right in the center of the city, close to downtown, great shopping, fine dining, the arts and the famous southwest Florida beaches. World Tennis Center Condos: Your private retreat in the heart of Naples! Nicely furnished and spotless condo in the well-known World Tennis Center, a gated community with 16 tennis courts, swimming-pool and spa, fitness center, sauna, steam room and Poolside Cafe. Very active community. This second floor condo offers 2 bedrooms, 2 baths, tiles throughout, newer appliances, granite counter tops in kitchen and bathrooms. Enjoy your breakfast and morning sun on your front balcony or a sip of good wine at sunset on your private lanai with a West exposure. This condo has a larger lanai and the master bedroom a walk-in closet. Weekly rentals are allowed. Enjoy a great location close to shopping, restaurants, Artis Naples and only 4 miles to the beaches. World Tennis Center Iii World Tennis Center Condos: Outstanding opportunity to own a two bedroom, two bath, 2nd floor condo in the heart of North Naples under $150,000 with reasonable condo association fees! This 2 bedroom condo been freshly painted and offers 850 square feet under air with a generous lanai overlooking a wooded preserve. World Tennis Center features 16 tennis courts (11 clay, 5 hard and 10 lighted for night play), a stadium court, full service pro shop and tennis staff offering instructions, programs and private and group lessons for all ages and ability levels. World Tennis Center guests accommodations include free use of tennis courts and other facilities. The Proshop offers matchmaking services, racquet stringing and repairs, tennis equipments, accessories and apparel sales. Owners are permitted 2 pets with condo association approval. 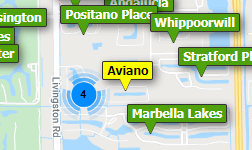 Just 3 miles to Naples beaches and walking distance to shopping & dining. Act fast!